Xcode provides everything developers need to create great applications for Mac, iPhone, and iPad. It is an Apple’s Integrated Development Environment (IDE). It contains a suite of software development tools developed by Apple for developing software for OS X and iOS. Xcode includes a source editor, a graphical user interface editor, and many other features Xcode has unified user interface design, coding, testing, and debugging all within a single window. The Xcode IDE analyzes the details of your project to identify mistakes in both syntax and logic; it can even help fix your code for you. Xcode includes the Xcode IDE, LLVM compiler, Instruments, iOS Simulator, the latest OS X and iOS SDKs, and hundreds of powerful features. 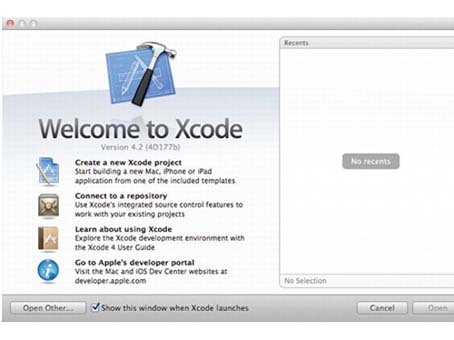 When you first launch Xcode, you’ll be presented with a welcome window like the oneshown in Figure 2. From here, you can choose to create a new project, connect to aversion-control system to check out an existing project, or select from a list of recently opened projects.